Based in Speyside, in the heart of Scottish Whisky County, Rant & Stave create beautiful and unique handcrafted and upcycled goods from vintage oak Whisky barrels. I'd already heard of them as they produced some wonderful branded items for North Hop Festival including cheeseboards and coasters. 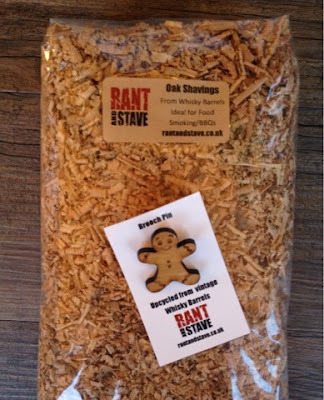 I was delighted to receive a parcel containing a bag of whisky barrel oak shavings to be used for food smoking and/or BBQ's, a personalised Foodie Quine Cheeseboard and the most adorable Gingerbread Man brooch pin. The products are beautiful to look at, wonderfully tactile and have an unbelievable smell! I have a real thing about Gingerbread Men so the brooch is absolutely perfect and I suspect that my Foodie Quine Cheeseboard will become a regular feature on the blog topped with all sorts of goodies. All Rant & Stave products come with free UK delivery and while there are a range of standard items there is always the option of bespoke and personalised creations. I particularly love the distillery keyrings which come engraved with the coordinates of a Speyside distillery. Lots of ideal gifts for whisky lovers or those who just love beautiful handcrafted objects. Here's a fascinating wee photo montage of the whole process transforming a battered old barrel head into a beautiful piece of wood ready to be upcycled. 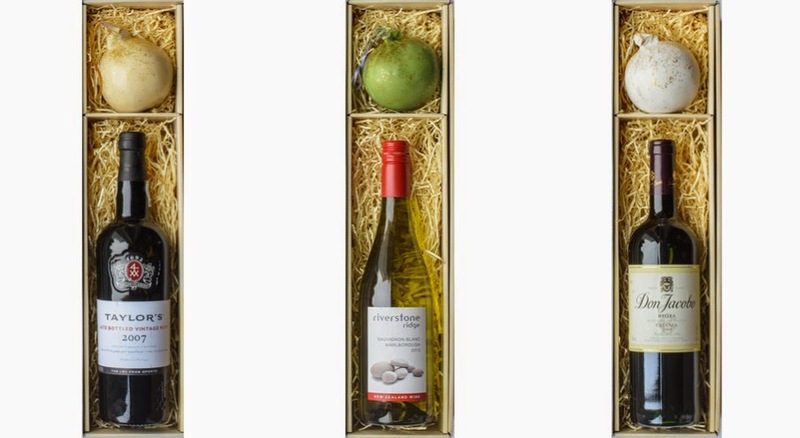 Based in Lancashire, Entwine Gifts provide a wine and cheese gift box service with a personal touch. They offer a selection of popular wine types from around the world and combine them with Lancashire Bomb cheese. 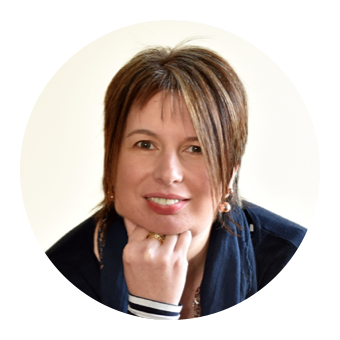 I opted to try out their Prosecco and Green Olive Cheese combo, which is suitably entitled "The Diva"
My box arrived within the guaranteed 48 hour mainland UK delivery and the packaging and contents looked fantastic. 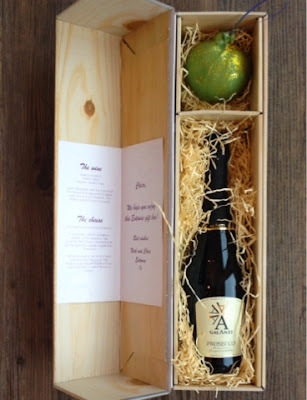 The box is wooden effect cardboard and nestled within shred is the bottle and the glittery cheese bauble. A personalised message can be added to the accompanying gift card which also included tasting notes for both the wine and cheese. There's 15% off all boxes this Christmas with prices starting at around the £22 mark for wines and increasingly accordingly for Port and Champagne. Both the cheese and fizz tasted great and the sparkly bauble was a real talking point. Once upon a time the only place you'd find a slate was on a roof. Now however they now grace many a stylish restaurant table. 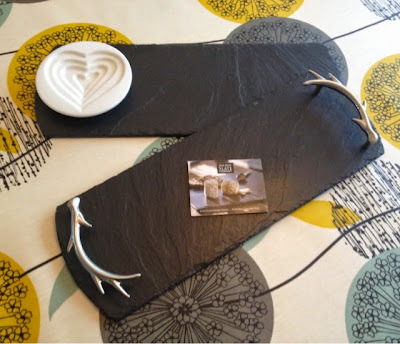 A stunning range of slate tableware, gifts and homeware is available from The Just Slate Company all of which is handcut in Scotland. Pretty much all of their items would make fantastic gifts and look equally at home in a traditional or contemporary setting. I received an Oil and Vinegar dipping set and a Slate Tray with Antler Handles. Both items are absolutely stunning to look at and came in stylish but sturdy gift boxes that will keep them safe between uses. I absolutely adore the antler handles on the tray. They will definitely be gracing my table over the festive period and beyond. No worries about any damage or scratching on surfaces from the slate as there's a foam backing on the base. I was unsure if the oil and vinegar dipping bowl would actually work but can assure you that it does. Proof in the photo with balsamic and olive oil. 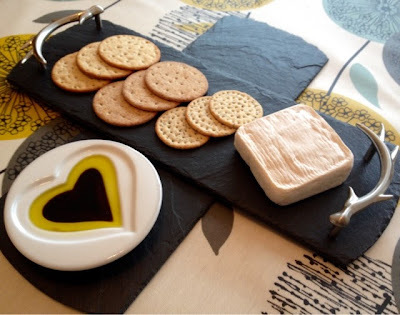 Lots of lovely items on the website including coasters, trivets, place mats, cheese boards, cakes stands and adorable butter cloches. 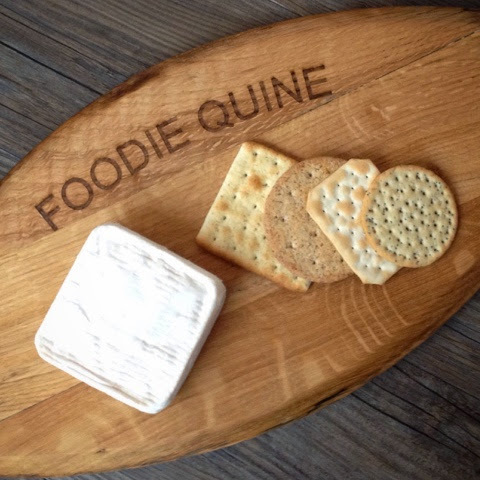 The Just Slate Company are offering a Foodie Quine 20% discount code on their website which is valid until 31st December 2014. To apply it, just enter FQ20 when it asked for “discount code” at the checkout. 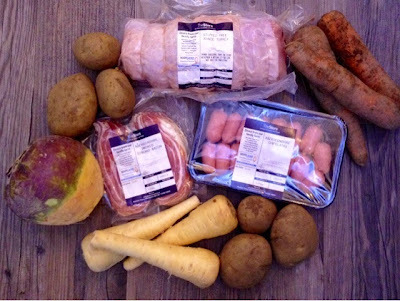 Based in Foveran Aberdeenshire, The Store is somewhat of a local institution with its own butchery, farm shop and deli, kitchen and coffee shop. This year they are offering a #storetodoor full Christmas dinner service of Festive Feasts to take the hassle out of Christmas dinner. These can be delivered locally, nationally or collected. I received their Easy Turkey Roast which feeds a minimum of 5 people. Next step up is a Free Range Feast for 8 or you can go all out with the Bronze Banquet which feeds a minimum of 10 with plenty leftovers. Also available are a huge range of hampers to suit every taste and budget featuring a fantastic range showcasing the best of Scottish produce and The Store's own butchery. 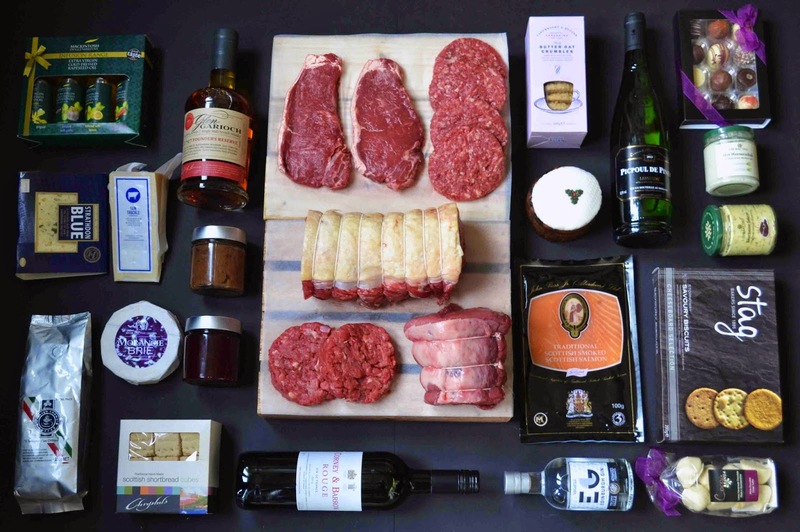 Bespoke Hampers can also be created along with specific Cheese, Steak, Roast and Breakfast Boxes. For the Aberdeenshire foodie who has everything, a voucher for a Butchery Masterclass would surely be the perfect gift. You start the day with Bacon Rolls & Coffee, followed by a tour round the butchery and maturation chill. The Store's Butcher will demonstrate his skills before you have a go for yourself. Finally a meaty lunch to finish off the half day experience. I really hope there's a voucher for this in my stocking. Disclosure : Thanks to Rant & Stave, Entwine Gifts, The Just Slate Company and The Store for providing the above products to review. All views expressed are my own.